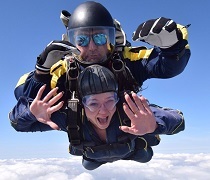 At the beginning of September, 18-year old Ami Crowley bravely undertook a sponsored tandem skydive to commemorate her grandmother Jayne, who sadly lost her battle with cancer in 2014. Jayne was a strong, inspirational and brave woman who worked as a nurse. She will always been remembered as someone who brought happiness and joy into any situation and was loved by many. 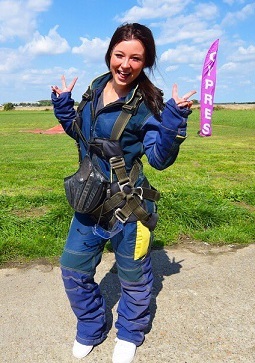 Ami’s skydive was crowd-funded, with the object of raising money for donating to Marie Curie Cancer Care, where her grandmother had worked, and Kernos. Announcing her venture at The Kernos Centre’s 15th Anniversary celebration back in April, Ami said: “Kernos is a fantastic charity, with amazing staff who work so hard, and I cannot thank them enough personally for everything they have done for me. I would like to give them something back as a thank you, and also to help others in need”.